Everyone loves a good game! Think about the game shows we watch and how we become addicted to cell phone games and video games. Now, imagine how much your students must love games as well. Instructional games will engage all learners in the content and reinforce those essential words or concepts they need to go to the next level of instruction. 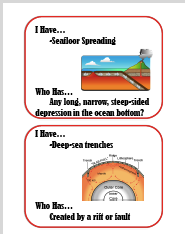 The picture above shows a set of IHWH Game Cards for Earth Science, these cards can be printed in color or black and white (I provided a sample) and can be printed 1, 2 , or 4 to a page. It just depends on what is available to you. I personally like 2-­‐4, so they can be stored in ziplock bags. There are several ways to use this game to engage students. The first suggested way is to introduce a unit by playing the game before they have been taught the content. This is an excellent way to get an idea of what your students know and what they don't know. Give each student in the classroom a card. Then, have one person in the class call out their card and the students work together to put all cards in order. This leads to discussion, engagement, and each student sees a visual representation of the word before you have even taught the unit. To make this even more engaging, you can time the class and have them work throughout the unit to beat their own time or another classes time. Great for competition. This would also be a good activity to throw in when the class gets dull or before the test as a review. Use these cards by printing multiple sets for student groups or centers. Have the groups work to put the cards in order. You could also send these cards home with kids that need some extra study time. 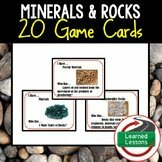 These are just a few ways to use these game cards to make learning fun and engaging for all students! They are available in my store for Physical Science, Civics, Life Science, American History, Earth Science, World History, English, and World Geography!